The Butterfly Pose is the one of the most therapeutic yin yoga poses, because it effects six energy meridians in the body and decompresses the spine. If there were only one pose that you could do, this is the pose with the most benefit for you and your hip joints! You may already be familiar with the Bound Angle Pose in traditional, yang yoga. It is a pose that requires external rotation of the hip, and is very difficult for most "normal" people. The Butterfly Pose is a variation of the Bound Angle Pose, but is done in an altogether different fashion. In traditional, high-energy, muscle-activating yang yoga poses, one strives for the perfect pose. There is a lot of effort put into the pose to get to where you hope you can be with your body, pulling your feet as close to your pubic bone as possible! In Yin Yoga, the opposite is true. With the Butterfly Pose, and all Yin Yoga poses, you are content and accepting where your body is in the moment. You release your muscles and all effort! You relax and melt into the pose with loving kindness for your body, wherever it lands. To read more about how Yin Yoga differs from traditional, Yang Yoga, and how it can deepen your practice, please click here to read my article addressing the subject. 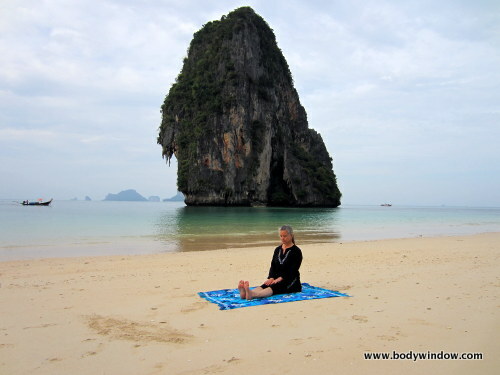 I have learned that the Butterfly Pose is a great pose to begin a Yin Yoga session. It doesn't feel as threatening as some of the other more intense hip-opening poses like the Sleeping Swan Pose, the Square Pose or the Shoelace Pose. The Butterfly pose, unlike the sitting Forward Fold Pose, with legs extended, allows for a nice flexion at the hip due to the forward tilt of the hips and the concomitant decompression of the spine. This pose really does feel lovely and deeply releasing when done in the Yin fashion. In order to come into the Butterfly Pose, sit on the ground with your legs extended in front of you like I show below. Bring the bottom of your feet together, allow your knees to fall open and bring your legs into a soft diamond shape. Do not bring your feet tight into your groin like the Bound Angle Pose. Instead, extend your feet and look at the inside of your legs. It should be a perfect diamond. Don't worry about how high or low your knees are! 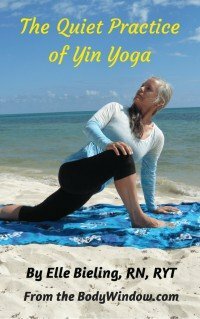 The Yin Yoga poses have unique names, intentionally, so you understand that the action of the pose is different from the similar yang yoga pose. Or, better stated, the non-action of the pose. Now, slowly fold forward at the waist until you come to an appropriate edge for your body. If you cannot forward fold at all, due to discomfort and tightness in your hips, this is fine. Just stay upright and allow the legs/knees to provide the weight to open your hips. As an alternative, you may also do this pose with your hips and back against the wall for support. This is effective if your hamstrings are tight as well. If you have sciatica, please know that this pose will aggravate your condition, and please do not do it. If you do not have sciatica, this pose may increase your risk, because it will give extended pressure on your piriformis muscle, deep in the hip which may compress the sciatic nerve. If you feel any tingling in your legs during this pose that is more than mild, you may lift your hips onto a cushion while in the pose. The additional pelvic tilt will prevent sciatica. If you have inner or outer knee pain when you attempt this pose, you may try adding soft padding under your knees. If the padding does not alleviate the knee pain, do not do the pose. If you have tight ankles and this pose pulls on your ankles too much, you may wish to pad your ankles to see if the pain dissipates. If it does not, do not do this pose. If you are able to fold forward without pain, with or without the use of props, walk your hands forward to your slight edge. You may wrap your hands around your feet as shown in the picture below. Remember, if you don't go to your farthest edge immediately, you can hold the pose longer. This is important because the deeper tissues are more effectively mobilized, energized and lubricated with long, slow holds over a longer period of time, than a shorter and more intense hold. No bouncing at all while holding this pose! This is commonly seen in yoga classes and will cause more harm than good. The Butterfly Pose requires the external rotation of the hips, and some hips just do not do this! If your body does not feel safe in this pose, whether in the hips, knees or ankles, do the Eye of the Needle Pose or the Lying Butterfly Pose, below. Both of these alternatives offer a more mild externally rotating hip position than the sitting position. You may enjoy either of these poses more and get the same effect. Please listen to your Body Window messages and do not attempt this pose if you continue to have more than mild pain with the adaptations. Sometimes I do the the Lying Butterfly Pose, just for itself. I offer this pose in my classes regularly, just prior to Savasana (Final resting pose). It is a lovely way to begin to settle into yourself in a more relaxed manner. If you are able and wish to go deeper, and your hips, knees, back and ankles feel safe, walk your hands even farther away from your hips and feet as shown in the next picture, below. You can drape your upper body over a yoga bolster or a cushion to aid in the relaxation of your upper body. You may also place your elbows on the cushion or bolster. Relax and allow all the muscles of your head, neck, back and legs to relax and release into this pose. The more relaxation you attain and the longer you hold the pose, the more benefit to your joints, fascia, ligaments and tendons. All yin yoga poses should be held for a minimum of 3-5 minutes. You can hold this pose longer, if you desire. When I do this pose in my home practice, I find that I can lose myself in it and the time quickly passes by. It is truly a personal favorite. Yin yoga poses are a perfect opportunity to stay in the moment with your body, and practice the presence in meditation. This is meditation using the body, allowing your body to be part of your soul's experience. There are many internal, meditative methods you may employ while doing this pose. I suggest belly breathing to enhance your awareness of the energy and spirituality of your body. Ujjayi breathing is also effective. Or just simply, focus on your normal breathing, or evening the breath's inhale and exhale, like I teach in conscious breathing. The pressure of this pose on the abdomen, as you fold forward also brings awareness to the abdomen, your personal portal to the spiritual realm. This internal "ground of being" as Sarah Powers calls it, is your invisible energy meridian that connects you to yourself and to the Earth. I call this the "core of my being," that utilizes 2nd Chakra energy. In addition, there are three meridians, from the Chinese Medicine system that run through the inner thighs. These are the Kidney, Liver and Spleen meridians. Whenever there is pulling on the groin area, these energy channels are activated for the better flow of your chi (qi). No wonder this pose is so therapeutic! Through the self-accupressure of this Yin Yoga pose, you are stimulating your Water energy (Kidney), Earth energy (Spleen) and Wood energy (Liver). When you come out of this pose, do it on an inhale. Go slowly, walking your hands up carefully as your hips get a new flood of energy and blood. You may feel stiff, like an old person, until your chi is fully restored in the joint. Even though you feel stiff coming out, your joints will feel charged with energy and lubrication in a few minutes. The counter pose to the Butterfly Pose, is Knees Into Chest Pose. Roll back, onto your back, and bend your knees, hugging them to your chest. Or you may do the Reverse Table Pose, to open the hip in the opposite direction. May you find stillness, presence and increased awareness, when you stay in this therapeutic pose. May your hips joints carry more chi, more energy, more mobility, so that you age with dignity and grace when you do the Butterfly Pose!